Solar energy technologies produce electricity from the energy of the sun. Small solar energy systems can provide electricity for homes, businesses, and remote power needs. Larger solar energy systems provide more electricity for contribution to the electric power system. 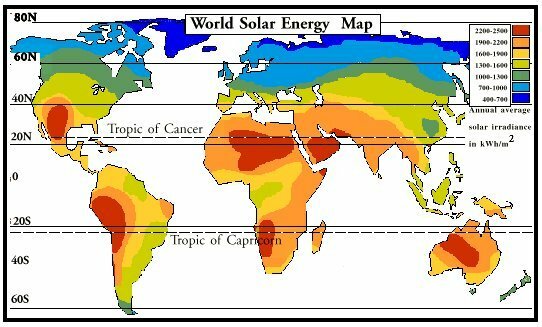 We have always used the energy of the sun as far back as humans have existed on this planet. As far back as 5,000 years ago, people "worshipped" the sun. Ra, the sun-god, who was considered the first king of Egypt. In Mesopotamia, the sun-god Shamash was a major deity and was equated with justice. In Greece there were two sun deities, Apollo and Helios. The influence of the sun also appears in other religions - Zoroastrianism, Mithraism, Roman religion, Hinduism, Buddhism, the Druids of England, the Aztecs of Mexico, the Incas of Peru, and many Native American tribes. Solar energy technologies harness the sun's energy for practical ends. These technologies date from the time of the early Greeks, Native Americans and Chinese, who warmed their buildings by orienting them toward the sun. Through most of history people considered the power of the sun when designing buildings. After the industrial revolution the practice of utilizing the sun was abandoned. Past societies such as the Greek, Roman, Native American, Celtic all revered the sun and put its thermal - or heat - energy to work. Ancient cities were positioned to use the sun for it's warmth in the winter, and to be shaded from the heat in the summer. Native Americans developed and refined many building forms and construction methods that we can learn from today. The Anasazi of the southwest created houses that through their design stayed warm in the winter and yet cool in their hot desert summers. 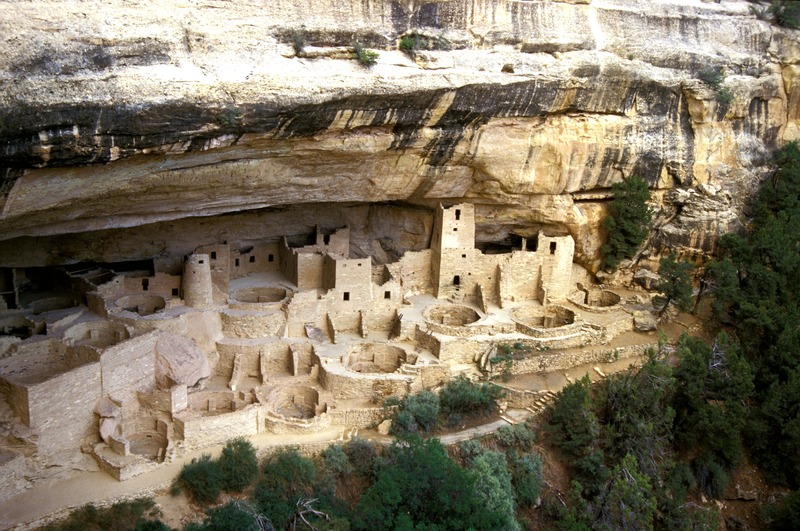 At the ancient Indian sites of Mesa Verde and Pueblo Bonito,"pretty village" in Spanish, the ruins reveal houses ingeniously laid out to maximize their solar energy gain by following the cycles and angles of the sun. The Ancient Romans and Greeks both had their own "energy crisis" in the b.c. time period. They used all of the wood surrounding their cities and did not plan ahead by planting more trees. They had to get wood from far away sources. The ancient Greeks planned whole cities in Greece and Asia Minor such as Priene, to allow every homeowner access to sunlight during winter to warm their homes. By running the streets in a checkerboard pattern running east-west and north-south pattern every home could face south, permitting the winter sun to flow into the house throughout the day. 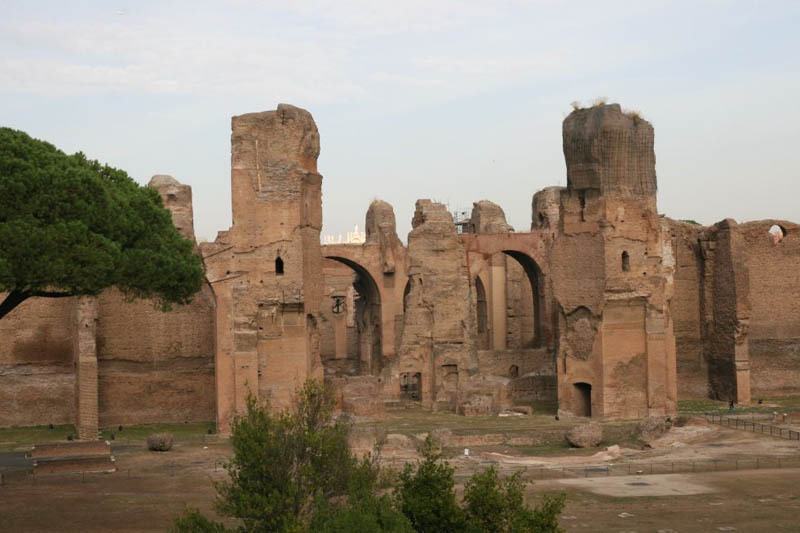 Roman bath houses in the first to fourth centuries A.D. had large south-facing windows to let in the sun's warmth. The Roman Empire had solar access laws, and the Doctrine of Ancient Lights protected landowners' rights to light in nineteenth-century Britain. Several dozen U.S. communities adopted solar access regulations in the 1970s and early 1980s in response to the energy crisis. Solar energy—power from the sun—is free and inexhaustible. This vast, clean energy resource represents a viable alternative to the fossil fuels that currently pollute our air and water, threaten our public health, and contribute to global warming. Solar Energy is a clean environmentally friendly source of power. Each day more solar energy falls to the Earth than the total amount of energy the planet's 6 billion inhabitants would consume in 27 years. The photovoltaic cell is the basic building block of a PV system. Individual cells can vary in size from about 1 cm (1/2 inch) to about 10 cm (4 inches) across. However, one cell only produces 1 or 2 watts, which isn't enough power for most applications. To increase power output, cells are electrically connected into a packaged weather-tight module. Modules can be further connected to form an array. The term array refers to the entire generating plant, whether it is made up of one or several thousand modules. As many modules as needed can be connected to form the array size (power output) needed. The performance of a photovoltaic array is dependent upon sunlight. Climate conditions (e.g., clouds, fog) have a significant effect on the amount of solar energy received by a PV array and, in turn, its performance. Most current technology photovoltaic modules are about 10 percent efficient in converting sunlight with further research being conducted to raise this efficiency to 20 percent. The pv cell was discovered in 1954 by Bell Telephone researchers examining the sensitivity of a properly prepared silicon wafer to sunlight. Beginning in the late 1950s, pvs were used to power U.S. space satellites. The success of PVs in space generated commercial applications for pv technology. The simplest photovoltaic systems power many of the small calculators and wrist watches used everyday. More complicated systems provide electricity to pump water, power communications equipment, and even provide electricity to our homes. Photovoltaic conversion is useful for several reasons. Conversion from sunlight to electricity is direct, so that bulky mechanical generator systems are unnecessary. The modular characteristic of photovoltaic energy allows arrays to be installed quickly and in any size required or allowed. Also, the environmental impact of a photovoltaic system is minimal, requiring no water for system cooling and generating no by-products. Photovoltaic cells, like batteries, generate direct current (DC) which is generally used for small loads (electronic equipment). When DC from photovoltaic cells is used for commercial applications or sold to electric utilities using the electric grid, it must be converted to alternating current (AC) using inverters, solid state devices that convert DC power to AC. Historically, pvs have been used at remote sites to provide electricity. However, a market for distributed generation from PVs may be developing with the unbundling of transmission and distribution costs due to electric deregulation. The siting of numerous small-scale generators in electric distribution feeders could improve the economics and reliability of the distribution system. Photovoltaic (or PV) systems convert light energy into electricity. The term "photo" is a stem from the Greek "phos," which means "light." "Volt" is named for Alessandro Volta (1745-1827), a pioneer in the study of electricity. "Photo-voltaics," then, could literally mean "light-electricity." Most commonly known as "solar cells," PV systems are already an important part of our lives. The simplest systems power many of the small calculators and wrist watches we use every day. Photovoltaics are one of the fastest growing solar energy technologies. Photovoltaic devices, commonly called solar cells or modules, use semiconductor material to directly convert sunlight into electricity. Solar cells have no moving parts—power is produced when sunlight strikes the semiconductor material and creates an electric current. Photovoltaic (PV) cells are made primarily of silicon, the second most abundant element in the earth's crust, and the same semiconductor material used for computers. When the silicon is combined with one or more other materials, it exhibits unique electrical properties in the presence of sunlight. Electrons are excited by the light and move through the silicon. This is known as the photovoltaic effect and results in direct current (DC) electricity. PV modules have no moving parts, are virtually maintenance-free, and have a working life of 20 - 30 years. PV cells use the energy from sunlight to produce electricity–the fuel is free. With no moving parts, the cells require little upkeep. These low-maintenance, cost-effective PV systems are ideal for supplying power to communications stations on mountain tops, navigational buoys at sea, or homes far from utility power lines. Because they burn no fuel and have no moving parts, PV systems are clean and silent. This is especially important where the main alternatives for obtaining power and light are from diesel genertors and kerosene lanterns. As we become more aware of "greenhouse gases" and their detrimental effects on our planet, clean energy alternatives like PV become more important than ever. The three basic types of solar cells made from silicon are single-crystal, polycrystalline, and amorphous. Single-crystal cells are made in long cylinders and sliced into round or hexagonal wafers. While this process is energy-intensive and wasteful of materials, it produces the highest-efficiency cells—as high as 25 percent in some laboratory tests. Because these high-efficiency cells are more expensive, they are sometimes used in combination with concentrators such as mirrors or lenses. Concentrating systems can boost efficiency to almost 30 percent. Single-crystal accounts for 29 percent of the global market for PV. Polycrystalline cells are made of molten silicon cast into ingots or drawn into sheets, then sliced into squares. While production costs are lower, the efficiency of the cells is lower too—around 15 percent. Because the cells are square, they can be packed more closely together. Polycrystalline cells make up 62 percent of the global PV market. Amorphous silicon (a-Si) is a radically different approach. Silicon is essentially sprayed onto a glass or metal surface in thin films, making the whole module in one step. This approach is by far the least expensive, but it results in very low efficiencies—only about five percent. Solar cells—the basic building blocks of a PV system—consist of semiconductor materials. When sunlight is absorbed by these materials, the solar energy knocks electrons loose from their atoms. This phenomenon is called the "photoelectric effect." These free electrons then travel into a circuit built into the solar cell to form electrical current. Only sunlight of certain wavelengths will work efficiently to create electricity. PV systems can still produce electricity on cloudy days, but not as much as on a sunny day. The basic PV or solar cell typically produces only a small amount of power. To produce more power, solar cells (about 40) can be interconnected to form panels or modules. PV modules range in output from 10 to 300 watts. If more power is needed, several modules can be installed on a building or at ground-level in a rack to form a PV array. About 10–20 PV arrays can provide enough power for a household. 1839 Edmund Becquerel, a French physicist observed the photovoltaic effect. 1880's Selenium PV cells were built that converted light in the visible spectrum into electricity and were 1% to 2% efficient. Light sensors for cameras are still made from selenium today. In the early 1950's the Czochralski meter was developed for producing highly pure crystalline silicon. 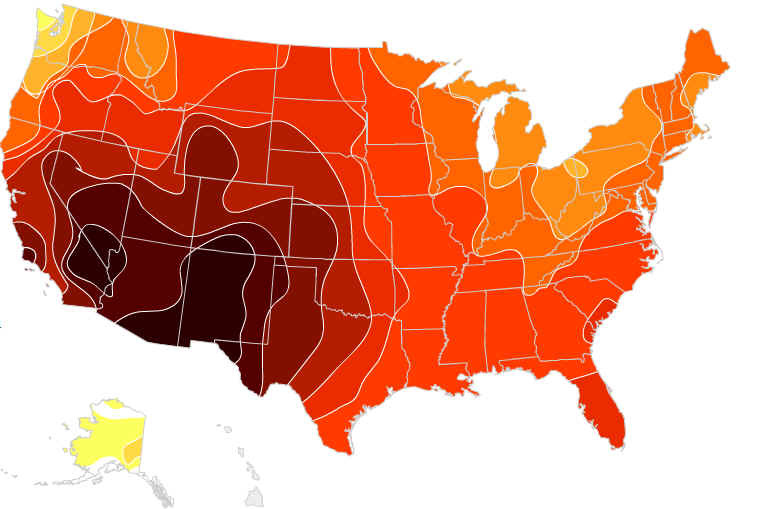 In 1954 Bell Telephone Laboratories produced a silicon PV cell with a 4% efficiency and later achieved 11% efficiency. In 1958 the US Vanguard space satellite used a small (less than one watt) array to power its radio. The space program has played an important role in the development of PV's ever since. During the 1973-74 oil embargo the US Department of Energy funded the Federal Photovoltaic Utilization Program, resulting in the installation and testing of over 3,100 PV systems, many of which are in operation today. The sun is a very intense source of energy. When designed properly, a passive solar home can experience heating costs that are 80% to 95% lower than for the average home. Air conditioning costs can also be reduced to a minimal level. 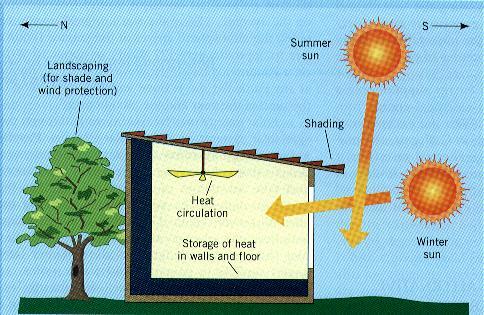 The basic idea of passive solar home design is to invite sunlight into the house during the winter, and once it is inside the home, to hold it in and store it until nighttime. Conversely, the sun needs to be kept out during the summer. When sunlight reaches the Earth, it is distributed unevenly in different regions. 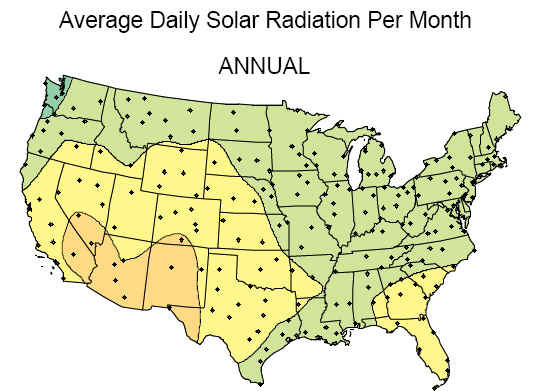 Not surprisingly, the areas near the equator receive more solar radiation than anywhere else on Earth. Many power plants today use fossil fuels as a heat source to boil water. The steam from the boiling water spins a large turbine, which drives a generator to produce electricity. However, a new generation of power plants with concentrating solar power systems uses the sun as a heat source. The three main types of concentrating solar power systems are: linear concentrator, dish/engine, and power tower systems. Linear concentrator systems collect the sun's energy using long rectangular, curved (U-shaped) mirrors. The mirrors are tilted toward the sun, focusing sunlight on tubes (or receivers) that run the length of the mirrors. The reflected sunlight heats a fluid flowing through the tubes. The hot fluid then is used to boil water in a conventional steam-turbine generator to produce electricity. There are two major types of linear concentrator systems: parabolic trough systems, where receiver tubes are positioned along the focal line of each parabolic mirror; and linear Fresnel reflector systems, where one receiver tube is positioned above several mirrors to allow the mirrors greater mobility in tracking the sun.